One day last year, in Professor Stephan Garcia’s Number Theory and Cryptography class, the lesson took a surprising turn. 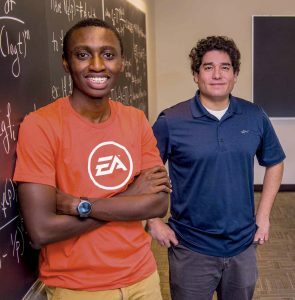 Looking at the chart, Elvis Kahoro ’20 noticed something interesting about pairs of primes known as “twins”—primes that differ by exactly two, such as 29 and 31. The smaller of the pair always seemed to have as many or more primitive roots than the larger of the two. He wondered if that was always true. “So I just asked what I thought was a random question,” Kahoro recalls. It was the kind of curious question he was known for asking all through his school years, sometimes with unfortunate results. “Some teachers would get mad at me for asking so many questions that led us off the topic,” he remembers. But Garcia took the first-year student’s question seriously. And the next day, the professor called Kahoro to his office, where he’d been doing some number-crunching on his computer. Garcia and a frequent collaborator, Florian Luca, then found a theoretical explanation for the phenomenon, resulting in a paper titled “Primitive root bias for twin primes,” to be published in the journal Experimental Mathematics, with Kahoro listed as a co-author. Come to the United States from Kenya at the age of 3 and grow up in Kennesaw, Georgia, about 30 miles north of Atlanta. Go to public schools and discover that (a) you love math and (b) you love finding patterns. In seventh grade, play a video game based on the Japanese anime Naruto. Discover the source code for the game online and find yourself fascinated by the logic of its code. Decide you want to make computers your life’s work. Choose to attend the STEM magnet program at Kennesaw Mountain High School because it offers lots of AP classes, including one in your #1 interest, computer science. Join lots of organizations, and do about a thousand hours of community service. Learn about the QuestBridge program from another student, apply and get accepted. At a QuestBridge conference, learn about Pomona College from your group leader, recent Pomona alumna Ashley Land ’16, who urges you to apply. Visit Pomona on Fly-in Weekend, meet a number of faculty who make you feel at home and discover that the College’s support for DACA students like you is the best in the country. Apply for early admission and get accepted. During your first semester at Pomona, take a Linear Algebra course with Professor Stephan Garcia, whose problem-solving approach to teaching impresses you so much that you can’t wait to take another course with him second semester. In Number Theory and Cryptography class during your second semester, look at a chart of prime numbers and notice something intriguing. Ask a question, and learn how just asking the right question can open unexplored frontiers of new knowledge.